"I'm bad with names." May be you've used it, may be you've got to hear it a number of times. If you find it difficult to recall names or go blank in a conversation just because you forgot the name, fret not. This MissionSelf post has easy memory tricks and techniques for remembering them. Master one or two and you'll be just there. If I had my clone take a test for me, it's likely I'd misspell my own name. And I'm terrible at remembering people's names-even if that person is me. You are attending a social event, a party, or some corporate event. And you hear your name! Don't you feel flattered when someone involves your name in the conversation? That person sure stands out from the crowd in your eye. Now, consider forgetting names while talking to people. Try forgetting a name at a conference or meeting. Might have happened with you. It sends a clear message that you do not view them crucial enough. Learning their name is a sign of showing respect for them. Using names while conversing is one of the most essential things for maintaining a rapport with the person. It's like possessing a key to their heart. Forget forgetfulness and start remembering! Go through these memory strategies and improve your ability to recall names. The most important thing is to listen to the person's name! It's no hidden fact that most people don't listen. Daydreaming about something, woolgathering, not paying attention during the introduction, etc., are symptoms of being inattentive that leads to forgetting names for sure. Pay attention at least during your debut meet; it will save you awkward moments in future interactions. If you're unclear about it, ask its meaning. Many times, we tend to forget names 'cause we never got them in the first place. You can go in like, Your name sounds quite interesting/unusual; what does it mean? Evoke lifelike images within the mind. We, humans, have an inbuilt face-recognition software. Pick the first feature in the person's face that grabs your attention―create a caricature in your mind―something in their face that makes them remarkable. Dramatize a distinguishing feature, it can be anything like nose, eyebrows, but avoid characteristics like attire, glasses―something that is easily changeable. Logically, associate with an animal or object. 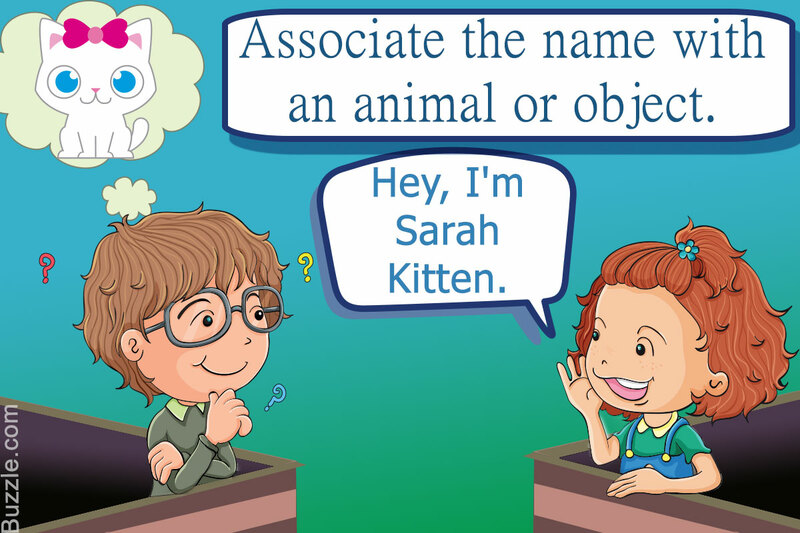 If you tend to forgetting names, why not associate them with animals or objects? This is quite normal for some of us. For instance, if the name is Mary Kitten―ah, there you got it! But be careful not to reveal it to them. Find a word that rhymes with the name. For example, "Kerry Berry". Easy? Did you try associating the name with something of similar meaning? Do that, it helps. For example, Clifford ... Cliff ... Mountain. Works for people with famous names! When you hear the name, first substitute it with a popular name―a famous personality, a business tycoon―that you can't associate with visual images. For instance, Jennifer Hershey can remind you of Jennifer Lopez. After your first conversation, repeat their name and something memorable you learned about them in your head a few times. For instance, "Isabella is into blogging." or "Chris likes cooking." or "Emily is a state champion in swimming." Associate names with things that people are ought to tell you―their hobbies, their profession, etc. Make alliterations mentally, instantly after you hear a name. You can pick something from their introduction. For instance, Jennifer is from Jersey. I know, it's embarrassing, but you gotta do it, rather than losing on it forever. You can start out with a compliment, such as "I've had fun talking to you, and I've totally forgotten your name." If you've blanked on a name just a few seconds after introduction, you can be honest and say: "I'm sorry, I missed your name." And finally, repeat their name in the conversation. And the most natural way to do it is to conclude your conversation with their name.